Bastardisation in the military has been much in the news these past few weeks, especially with the scandals at the Australian Defence Force Academy aired by the ABC on its recent Four Corners program. As I watched it all unfold, it stirred up mixed emotions for me – I am a graduate of the Royal Military College (RMC Class of 1980) who is about to return for the Centenary Graduation Parade … and yet to this point, I’d never really reflected on what we went through and why. One of the psychologists interviewed on that program was Stephen Mugford, who I know reasonably well. I sent him an email and I’ve decided to post it here on my blog. Not sure why. Perhaps more as a cathartic relief for yours truly, than for your benefit. it was great to see your “smiling” face on the TV after all these years. The footage and the stories on the Four Corners program brought back a flood of memories from my time at Duntroon – some of the footage in the old RMC mess was from my era, as I recognised quite a few of the faces. Whilst I never saw any of the extreme behaviour that was addressed by some of the case studies on the program, bastardisation was of course part of the DNA of RMC. 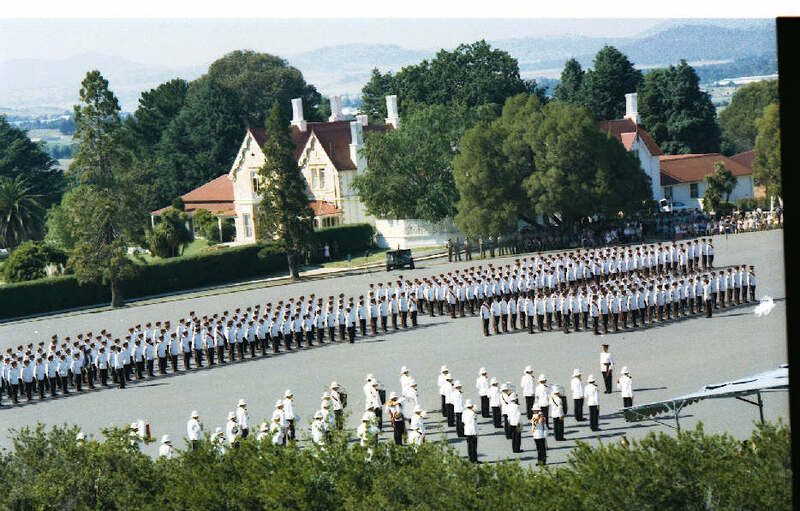 The thing that really struck me through the program – and this is the first time I’ve reflected on those years at RMC in a very long time – is that the institutionalised, unofficially sanctioned school-boy bullying (I think that’s really what bastardisation is) which deliberately feeds on the immaturity of cadets (a “Lord of the Flies” syndrome as it were) is so diametrically opposed to the standards, ethos and essence of what a military leadership training institution purports to be inculcating in its trainees … that it’s actually mind-bending. Back then, at an immature age, I was both the recipient of and the perpetrator of “bastardisation”. And I guess as I look back on it, I don’t think it’s had much of a lasting impact, although the habit of bullying was something that did take some unlearning, particularly for someone who is a strong personality as I am. In a sense I feel somewhat robbed that my inherent immaturity was used by the military hierarchy in such an appalling way – it seems to me that “the system” failed not only in its duty of care, but in taking the opportunity to contribute more profoundly to the moral fibre of myself and my colleagues. The former has had a range of impacts from moderate to devastating on every graduate. The latter, in the cold, hard light of day, is a wasted opportunity to maximise the taxpayer’s investment in its military leaders. The thing that you said in your interview that really hit home to me as being an absolute master stroke, was the idea of breaking the influence of the class hierarchy system and removing the virtual life-and-death control that senior cadets once exercised over junior cadets. If this is indeed happening and working, it’s a complete master stroke – I’m sure there are quite a few who hated you for it. Breaking institutionalised military culture ain’t an easy thing. I don’t imagine you get many Christmas cards from ADFA. But it’s the right thing. It gives me great comfort to know that you’ve been involved, but I also know that there will no doubt be a long way to go with this. Honour, loyalty, teamwork, trust … are the stuff of which esprit de corps is made. They’re forged yes, under pressure and under fire but clearly “bastardisation” is not the appropriate way of applying that pressure. In my view it costs so much more than it yields, and without a doubt “white ants” rather than strengthens the moral fibre and world view of our future leaders. Thanks for doing what you do – keep it up! I was at boarding school from age 8, my last 6 years in Sydney; in those days the senior year could laud it over the younger ones; the house prefects would haul you into their studies, akin to a kangaroo court, and apart from the verbal game they played they were then allowed to beat your bum with a sandshoe, sometimes making you bend over with your head almost touching the wall so that when they hit and it hurt your head hit the wall too; interestingly the nastiest of the prefects I remember is now an AC, QC and justice of the High Court 🙂 – when my year became senior we were much less aggressive and today this sort of behaviour is likely zilch. That said I don’t think it caused great harm to the majority but I’m sure it did affect numbers over the years. One thing I am thankful for is that I never heard of, and never experienced, any sexual harrassment. The latest ADF sexual scandal beggars belief, you wonder what enviroment these guys were brought up in and what must have been going through their minds – the participants and the watching participants. I think organisations like the ADF have a wonderful opportunity to input into peoples lives and I hope the outcome from all this latest stuff will see a new level of excellence for the ADF. Thank you for your posting Berni. Thank you for sharing your heart in such an open forum. I find great comfort in reading this, yet I cannot in anyway explain why.